Feb 6 Top 5 Stress Relieving Activities To Do With Your Children!! Hola!! How is everyone doing?? I hope everyone is doing well and enjoying their time with their children as they are growing up so quickly before our eyes. As a parent I clearly understand the high's and low's of raising children. The same feelings applies with caregivers, and we have to find ways to alleviate stressful days when caring for the little angels. Here are my top 5/ go-to's when things get a little sour working with kids and I don't mean the milk! COLOR- I know who has time for that? What I've found through my years of working with children coloring is very relaxing. When children get stuck in a moment (that we're not happy with and we've done everything to help them get back on track and it didn't work) Guess what I do? 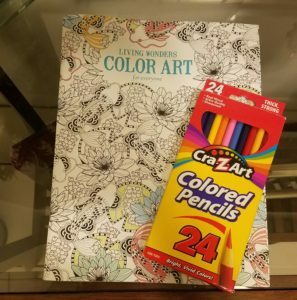 I pull out a coloring book and start coloring.....I use the words "when you're ready to have a good time come join me over here for some coloring." The fact that your eyes and attention is off of them almost always helps correct the behavior, and usually they will come color with you. (There are exceptions to this rule like they're sleepy, hungry etc. you would know what is going on during the melt down.) (Which from my experience melt downs can happen at any age for different reasons.) Ok back to the coloring.....have you tried the adult coloring books yet? At first I was thinking I don't need that I've been coloring for years in kids books what do I need an adult coloring book for? OH MY WHAT A STRESS RELIEVER!!!! I carry it to work and work in it at night before bed! 2. Play with playdough-My favorite activity especially with the younger child. My oh my how chatty, and excited they become when they see you creating objects with playdough! Making playdough with children is like a party for kids! The kids could measure and dump the ingredients in a bowl. They learn how to follow directions, use fine motor and math skills. There are several ways to make playdough click the link below for the recipes. 3. Hide-n Seek- This could be done indoors/outdoors no matter how old your children are the element of surprise, guessing, and mystery with this oldie but goodie game brings kids alive! 4. A quick card game, brain teasers, or regular good ole board games. A quick way to get everyone in a great mood! 5. Stretch or practice breathing exercises at home. Maybe take a class together. I love those Mommy and Me Yoga classes, swim class together, or a simple trip to the library. Reading together especially at the library makes our children feel really special! There are a lot of free activities in our cities and towns to engage children and families in a whole lot of fun!! If you live somewhere where there are limited activities to engage in then maybe you could start a playgroup with other families! I hope you could use some of these ideas to help everyone have more enjoyable days together! Would love to hear your thoughts? What activities do you engage in with your children to help keep everyone on the same page? Thanks for reading....have a great day with the little ones! Happy to connect with you please share or subscribe....Muchas Gracias!! Follow me on Twitter, instagram, or my youtube channel!! Feb 28 When Should Our Children Start Helping Out Around the House?